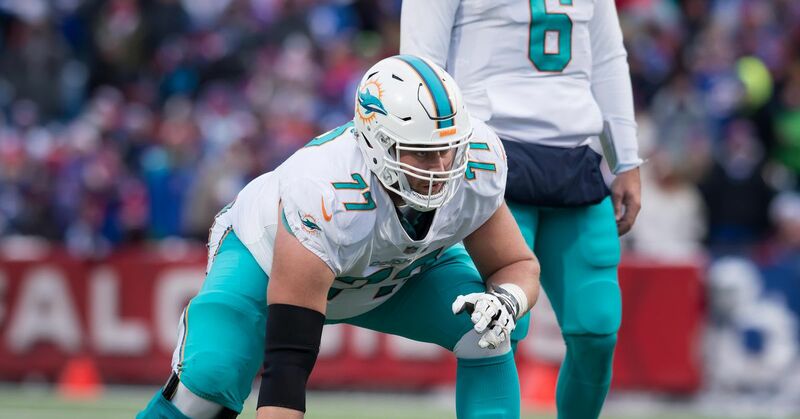 The Phinsider 90-in-90 series continues with another look at the Miami Dolphins’ roster. This series, an annual occurrence here on the site, takes a look at each player on the team’s 90-man preseason roster and how they performed in 2017, as well as why they could progress or regress in 2018. It then ends with a look at the chances the player has to make the 2018 regular season 53-man roster. This year, we have already finished the reviews for wide receiver Leonte Carroo, punter Matt Haack, safety T.J. McDonald, running back Buddy Howell, wide receiver DeVante Parker, defensive end William Hayes, wide receiver Isaiah Ford, safety/cornerback Walt Aikens, defensive end Claudy Mathieu, linebacker Kiko Alonso, cornerback Xavien Howard, long snapper Lucas Gravelle, wide receiver Danny Amendola, tight end A.J. Derby, running back Frank Gore, defensive tackle Gabe Wright, wide receiver Kenny Stills, cornerback Tony Lippett, kicker Jason Sanders, kicker Greg Joseph, left tackle Laremy Tunsil, tight end Mike Gesicki, linebacker Raekwon McMillan, running back Kalen Ballage, wide receiver Jakeem Grant, tight end Durham Smythe, quarterback David Fales, wide receiver Albert Wilson, defensive tackle Akeem Spence, linebacker Chase Allen, defensive end Cameron Wake, running back Senorise Perry, and tight end MarQueis Gray, offensive lineman Ted Larsen, defensive end Andre Branch, running back Kenyan Drake, defensive end Quincy Redmon, quarterback Bryce Petty, wide receiver Francis Owusu, defensive end Jonathan Woodard, defensive end Charles Harris, and center Connor Hilland. This evening, we add guard Jesse Davis. Davis entered the NFL as an undrafted free agent with the Seattle Seahawks in 2015, but did not make the roster and was out of the league for all of that year. He then signed with the New York Jets in 2016, missing the cut, but having a two-week stint on the team’s practice squad in the middle of the year, before joining the Dolphins practice squad near the end of the season. After signing a futures contract at the end of 2016, Davis went on to not only make the Dolphins’ 53-man roster at the end of the preseason, but he made his NFL debut in Week 1, playing in all 16 games last season. He started the final ten games of the season, two at left guard and the final eight at right tackle. Davis comes into this season as the presumed starter at right guard. He has shown the versatility to play in multiple positions along the offensive line, but having a solid position to call his own should allow him to continue to develop as an NFL offensive lineman. He proved to be valuable for the Dolphins in 2017, and will now be asked to do it as an every down player in 2018. A lot will be asked of Davis this year, and, while his growth from undrafted free agent who sat out a year to starter has been incredible, he now has to prove that last year was not the peak of his development. The return of Ja’Wuan James to the outside should help Davis, but now the two players have to make sure they are on the same page at all times, able to anticipate what they other player will do without any sort of communication – it is a lot to ask of any player. Davis is clearly on the roster and will be starting unless something goes poorly in training camp.